How Many Ways Can You Look At A Black Bird? Last week I wrote about the power and healing that can be experienced through connecting with our non-human friends, wild and domestic. This weekend, I led a wonderful circle of explorers in sharing the wisdom they had received from getting to know such diverse creatures as Mice, Honeybees, Octopus and even Unicorns. Perhaps not surprisingly, the critters that got the most enthusiastic response were the Raven and the Crow. Everyone, it seemed, had a story about an encounter with these intelligent and magical birds – as well as their own interpretation of what those encounters had meant. For one man, a large Raven presented the opportunity to see the world through another set of eyes. In another instance, a large gathering of Crows appeared as an invitation to change the way one woman led her life. Our group had used a deck of animal oracle cards as a jumping off point for the conversation, but the real purpose of the circle was to demonstrate that relying too much on an external interpretation of an animal’s “meaning” can separate us from our own understanding of that animal’s true “medicine”. Anyone who authors a deck of cards – or a book on divination or symbology – brings their own associations and biases to the symbols they are explaining. In many instances, those associations may help us understand something that is otherwise confusing. But at other times, someone else’s interpretation may only lead us further away from our own truth. If you’d like to begin listening for your own animal messages, you can start by educating yourself about an animal’s behaviors, talents and habits. Learning that a 90 foot octopus can fit through a 3 inch hole, for instance, recently inspired me to ponder how I too could squeeze my life through the eye of a needle. We all have the power to understand the Crow, the Raven, the Octopus or the Spider – if we just take the time to pay attention. 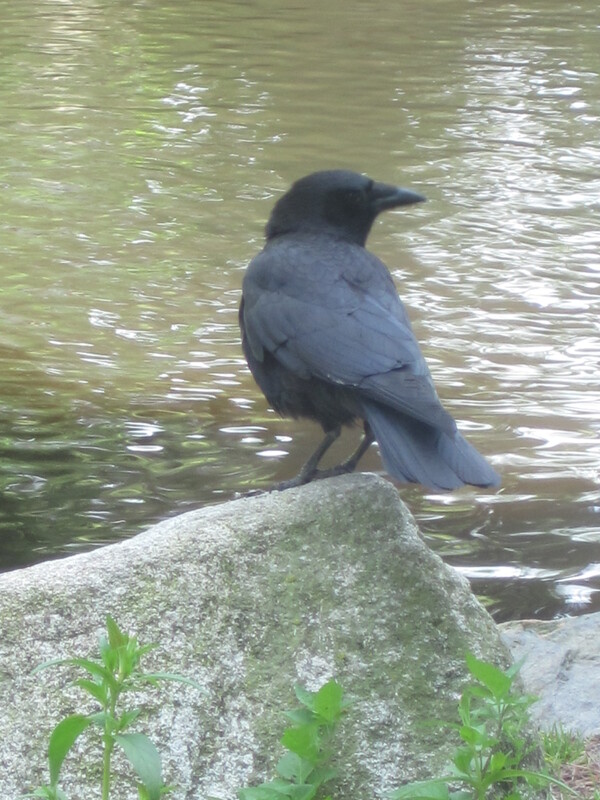 What an individual animal says to one person may not be the same as it what it says to another, and you may be surprised at what even the most common animal – like our friend the Crow – has to tell you. Thank you for this post, Jesica. There is so much truth in your words about Animal Medicine. It is a wonderful realization how this medicine can Transform our lives, each in it’s own special way, to a higher level of Spiritual Consciousness of ourselves and others. MANY PATHS>ONE DIRECTION. Living in the foothills of beautiful Ashland, Oregon, we are surrounded by small family tribes of deer, whose ancestors have been here for generations. The only real sound that accompanies them is the small rustling in the bushes when you come upon them or the musical clipity-clop of their tiny hooves hitting the pavement as they nimbly prance off onto a well known and well worn path into the wilderness that is commingled with the beautiful garden and yard property’s in this area. I call them the Deer people, but what I feel is that they are the “DEAR” people. I love how using all of their facilities and sense decipher whether they are in danger. They are uber-present. for such quiet animals, if I slow down, I can feel their deep sweetness and innocence penetrate me with their loving and curious gaze. The Dear people have such a sweet essence and their presence in my daily experience reminds me to travel lightly, be aware of my environment and be more humble in general, . As an aside in this area, while they are beautiful to look at, there is a long standing debate, because home owners complain about the damage to their gardens and how bold the dear have become over the years. How quickly we forget that humans moved into their land and it is up to us to co-exist in THEIR nature.